German submarine U-520 was a Type IXC U-boat of Nazi Germany's Kriegsmarine during World War II. 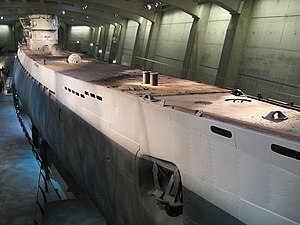 The U-boat was laid down on 1 July 1941 at the Deutsche Werft yard in Hamburg as yard number 335, launched on 2 March 1942 and commissioned on 19 May 1942 under the command of Kapitänleutnant Volkmar Schwartzkopff. After training with the 4th U-boat Flotilla, she was transferred to the 2nd flotilla for front-line service on 1 October 1942. German Type IXC submarines were slightly larger than the original Type IXBs. U-520 had a displacement of 1,120 tonnes (1,100 long tons) when at the surface and 1,232 tonnes (1,213 long tons) while submerged. The U-boat had a total length of 76.76 m (251 ft 10 in), a pressure hull length of 58.75 m (192 ft 9 in), a beam of 6.76 m (22 ft 2 in), a height of 9.60 m (31 ft 6 in), and a draught of 4.70 m (15 ft 5 in). The submarine was powered by two MAN M 9 V 40/46 supercharged four-stroke, nine-cylinder diesel engines producing a total of 4,400 metric horsepower (3,240 kW; 4,340 shp) for use while surfaced, two Siemens-Schuckert 2 GU 345/34 double-acting electric motors producing a total of 1,000 shaft horsepower (1,010 PS; 750 kW) for use while submerged. She had two shafts and two 1.92 m (6 ft) propellers. The boat was capable of operating at depths of up to 230 metres (750 ft). The submarine had a maximum surface speed of 18.3 knots (33.9 km/h; 21.1 mph) and a maximum submerged speed of 7.3 knots (13.5 km/h; 8.4 mph). When submerged, the boat could operate for 63 nautical miles (117 km; 72 mi) at 4 knots (7.4 km/h; 4.6 mph); when surfaced, she could travel 13,450 nautical miles (24,910 km; 15,480 mi) at 10 knots (19 km/h; 12 mph). U-520 was fitted with six 53.3 cm (21 in) torpedo tubes (four fitted at the bow and two at the stern), 22 torpedoes, one 10.5 cm (4.13 in) SK C/32 naval gun, 180 rounds, and a 3.7 cm (1.5 in) SK C/30 as well as a 2 cm (0.79 in) C/30 anti-aircraft gun. The boat had a complement of forty-eight. U-520 sailed from Kiel on 3 October 1942, she negotiated the gap between the Faeroe and Shetland Islands and then turned west toward Cape Farewell, (the southern tip of Greenland). After a brief journey in the direction of Iceland, she headed southwest, then south, before being sunk east of Newfoundland in position 47°47′N 49°50′W﻿ / ﻿47.783°N 49.833°W﻿ / 47.783; -49.833Coordinates: 47°47′N 49°50′W﻿ / ﻿47.783°N 49.833°W﻿ / 47.783; -49.833 by depth charges from a Canadian Douglas Digby light bomber of No. 10 Squadron RCAF. None of her 53 crew members survived the sinking. In January 2006 an article in the Edmonton Journal reported that a team of divers planned to search for U-520 and another U-boat, U-190. ^ Kemp 1999, p. 94. ^ a b Helgason, Guðmundur. "The Type IXC boat U-520". German U-boats of WWII - uboat.net. Retrieved 5 February 2010. ^ Helgason, Guðmundur. "War Patrols by German U-boat U-520". German U-boats of WWII - uboat.net. Retrieved 5 February 2010. ^ a b c d Gröner 1991, p. 68. ^ Helgason, Guðmundur. "Patrol of U-boat U-520 from 3 Oct 1942 to 30 Oct 1942". U-boat patrols - uboat.net. Retrieved 5 February 2010. Kemp, Paul (1999). U-Boats Destroyed - German Submarine Losses in the World Wars. London: Arms & Armour. ISBN 1-85409-515-3. Helgason, Guðmundur. "The Type IXC boat U-520". German U-boats of WWII - uboat.net. Retrieved 7 December 2014. "Alberta diver to search for WWII U-boats off East Coast". canada.com. Archived from the original on 13 May 2011. Retrieved 5 February 2010. This page was last edited on 7 November 2017, at 06:44 (UTC).